I have the first week of retirement under my belt and am ready to determine it all good! I do have to admit to a little disorientation. Hubby and I kept thinking every day was the weekend! We would get ready to do things that we normally do on Friday or Saturday and then realize that it was the middle of the week! If that's the only downside, I think we can get used to it fairly quickly. Notice the little dog nose. Maggie thinks she needs to be included in everything. 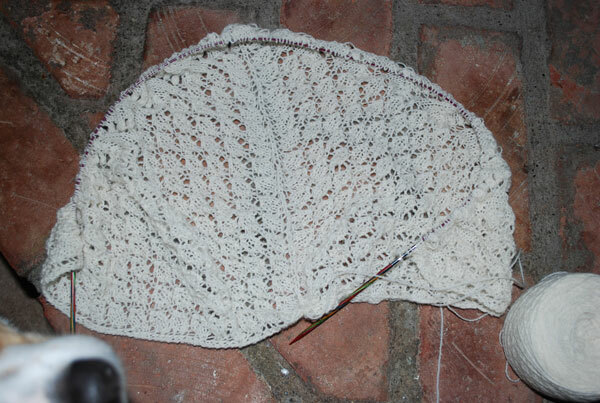 I decided I needed to get this done before starting the Enchanted Wood Mystery Shawl in January. 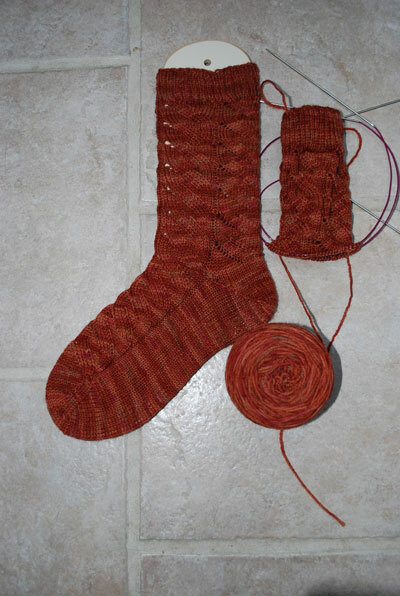 And, spurred on by Kris, I started a pair of Nutkin socks. This is a fun little pattern. I'm not ready to do multiple pairs, but am enjoying the process. Work also continues on a Reversing Tide scarf. This is a great, almost mindless pattern – very easy to memorize. The scarf is reversible, but has a different pattern on each side. The yarn is a lovely handpainted merino that came in one of my Embrace the Lace shipments. It was intended for knee socks, so the yardage is substantial. 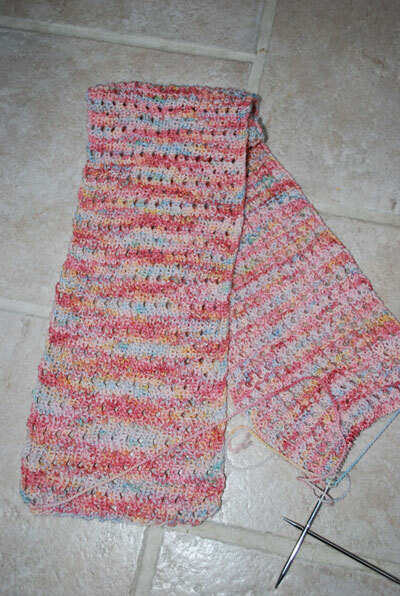 I just couldn't see this as knee socks, but it's making a beautiful scarf (maybe two!). 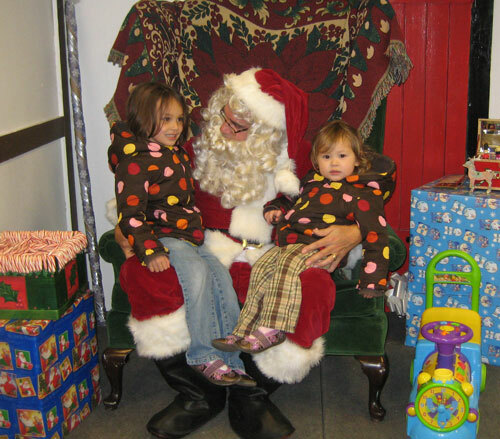 The girls really enjoyed it and we took them home with us for a sleep over, giving Ben & Abby a few childless hours. 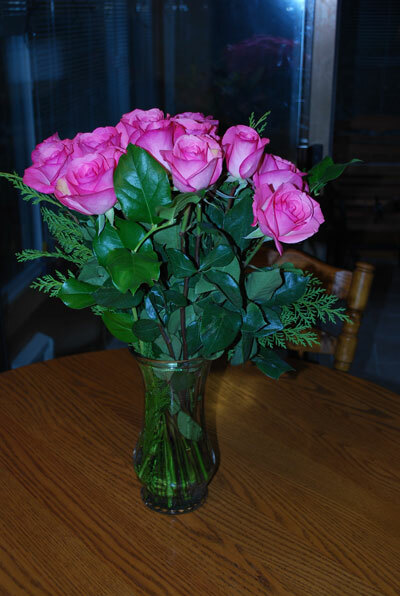 The next day we took them home, dumped them off and then went on a Christmas dinner cruise, given to us by the new doc and his wife as a retirement present. It's an Ashford Traveller. After much research I felt that I couldn't go wrong with an Ashford. On Thursday I attended a local spinning group and was welcomed with open arms. I think the ladies were really excited at getting their hands on a newbie! They've set me up with workshops, spin-ins and offered to give me all the guidance and lessons I could possibly use. Oh my – when did I have time to work??? I hope all of you have a very blessed Christmas. This year, especially, we are counting our blessings. We are so grateful for the good health and prosperity that God has given us, along with the blessings of a family that is near and time to enjoy them. But most of all we are grateful for the gift of God's Son sent to us. May His peace be with all of you. Merry Christmas! Happy Spinning! What a beautiful toy. Many hours of play in your future, I’m thinking. Thanks for mentioning my pattern! I’m glad you are enjoying it – I love the way the colors in your yarn are arranging themselves on it! Beautiful wheel! I’ll have to get up to Race Road one of these Thursdays! I knew you’d be busier in retirement! Oooh, that Ashford is gorgeous! And may I mention a certain shawl that is looking awesome!!!!! Nutkin is in my queue, too. I love that sock pattern. I am so happy for you, Dorothy. What a wonderful Christmas season you are having. May you and yours be blessed by His love all year long! Sounds like you are getting into the groove quite nicely! I am SO glad you chose the Ashford. I can not wait until we can get together and play! 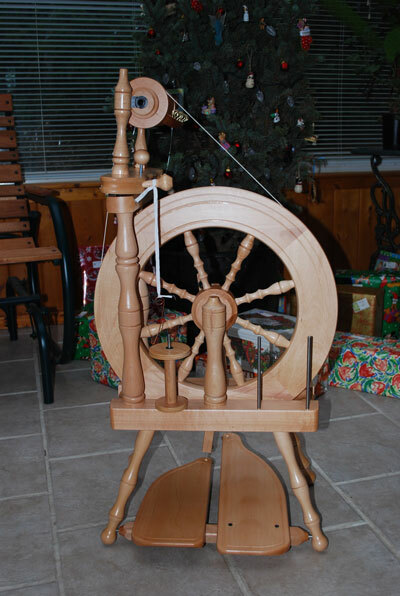 YAY — For retirement and spinning and Christmas…can’t wait to see that 1st yarn! It appears you haven’t had any problem getting into the retirement life style. Looking forward to seeing what you do with that wheel. I am so envious about your retirement! Wish I could do that. And I will see about a spinning video…have to locate a videocam and a person who knows how to use it. Have a lovely holiday! You are truly living the good life now! Merry Christmas. I love knitting swallowtail! (I’ve done several) Your Traveller is beautiful. I’m glad you got it finished. It’s beautiful that way. 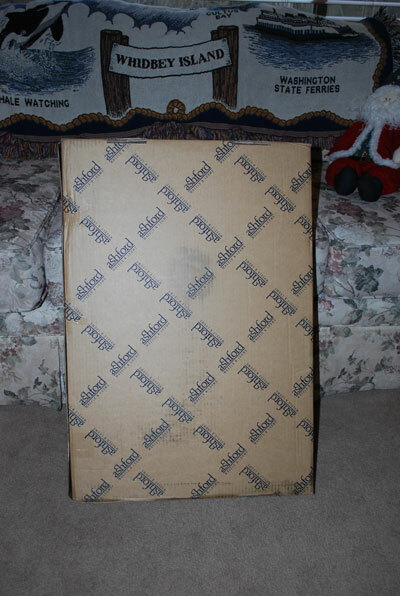 Can’t wait to see what you create with it! Congratulations on the wheel. I’m sure it will make your “retirement” even better. With all those things to do and the impressive progress on your knitting, you don’t seem to have much down time. That’s the beauty of retirement, every day is Saturday. It sounds like it’s going well so far. 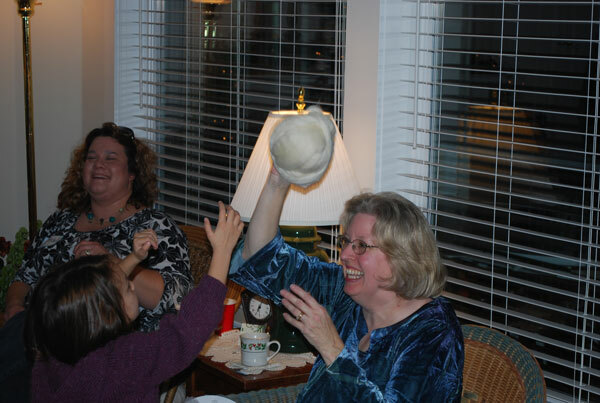 Happy everything – new year, birthday, retirement, spinning…. Yay for DOrothy! Plenty of time ahead for knitting, sewing and spinning! Contratulations, my friend.